And now, for a book review! I’ve been hearing a lot about this guy, Brandon Sanderson, for a while now – though I hadn’t read any of his books yet. It’s not for lack of wanting to read his books… I’ve attempted to check out a few of his books from the library, but there’s a ginormous line at the library for his Mistborn books, or whatever they’re called, and the one time I actually got to the front of the line, I couldn’t make it to the library before my hold expired. So, until recently, the only thing I’d read by him were his additions to Robert Jordan’s THE WHEEL OF TIME series. I do have a weird thing about books that are “too” popular. Something in me rebels against wanting to read them. And Sanderson has definitely hit that level known as, “Everyone in the fantasy community is buzzing about him” place. Which does make something ornery and stubborn rise up inside me. However, I did love what he did with the last three books in the Wheel of Time series. I think he did a great job staying true to Jordan’s vision, while also putting his own style into the story. I would say that Sanderson did a good job bringing the story back to the place where the writing began, lifting it up to the caliber that existed in the first 4 books of the series. That being said, I wasn’t really looking for a Sanderson book to read. A friend of ours lent a copy of STEELHEART to my husband, and I read the prologue and immediately put it down, convinced that I didn’t want to read any more. The prologue is raw, violent, and involves the murder of a baby, which is one of those things I just can’t abide in a story. Accidental death, death by sickness, okay, fine… I’ve even used it myself. But murder of an infant? Can’t handle it. My husband then read the book and convinced me that he believed I would actually like the rest of the book, and that there was nothing later in the story that I would find objectionable. So, I gave it another go. And I’m glad I did. Enter a world where super-human entities rule the general populace. A world in which anyone with super-human capabilities is also arrogant, evil, and power-hungry. There are no super-heroes. There are only super-villains. And they are known as Epics. In this world, specifically in Chicago, IL, there lives a young man whose father was killed by Steelheart, the most powerful Epic there is. But before his father was murdered, David saw Steelheart bleed… and he vows that he will see that happen again. 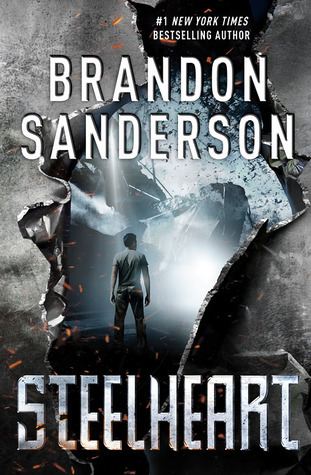 STEELHEART is a book that reads very quickly, has a lot of entertaining characters, and a good portion of humor to balance out the grim prologue. There is a lot of wit, a few mysteries to solve, and plenty of action throughout the book. I found it to be very enjoyable. It was very reminiscent of the sort of story one might find inside a Marvel comic book… except all the people with powers are villains, and the heroes are the everyday, ordinary people who resist the Epics’ reign of terror. I really enjoyed the way that Sanderson took a fairly common genre (the superhero genre) and turned it on its head. I liked that he worked in sci-fi technology without making my head hurt – he explained the tech simply, and didn’t spend too much time trying to force me to understand it. It just simply was – and there wasn’t too much of it… just a few things that were Tony Stark-worthy inventions. And then there were a few twists at the end – I sort of saw all of them coming, but that did not detract from the enjoyment factor, as there was just enough I wasn’t able to predict to make the ending still a surprise. The only downside to this book? I have to wait until January to get my hands on the sequel! Despite the rocky beginning, I have to admit that this book is worthy of 5 Dragon Eggs, definitely! I love your idea of dragon eggs instead of stars!! !